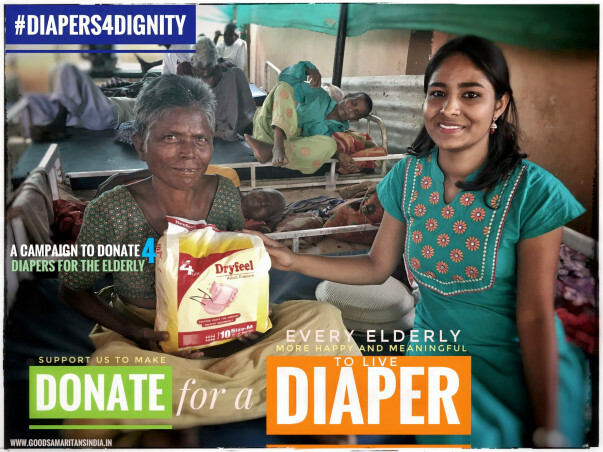 Donate Adult Diaper 4 Abandoned Aged Citizens. Support our campaign to make every elderly more happy and meaningful to live. Imagine the plight of a homeless elderly with urinary incontinence. 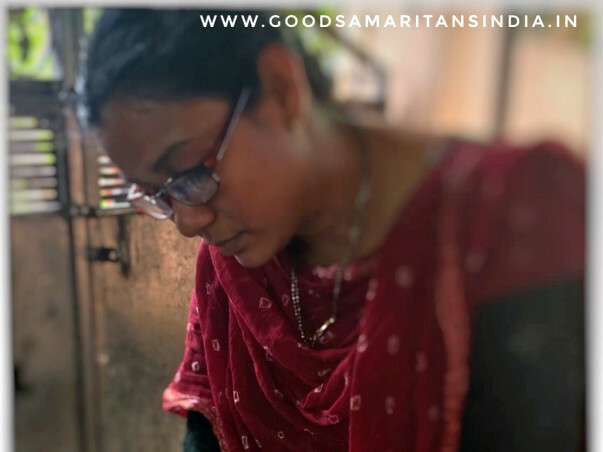 Good Samaritans India for the homeless elderly understands this sensitive matter that requires careful consideration of urinary incontinence. 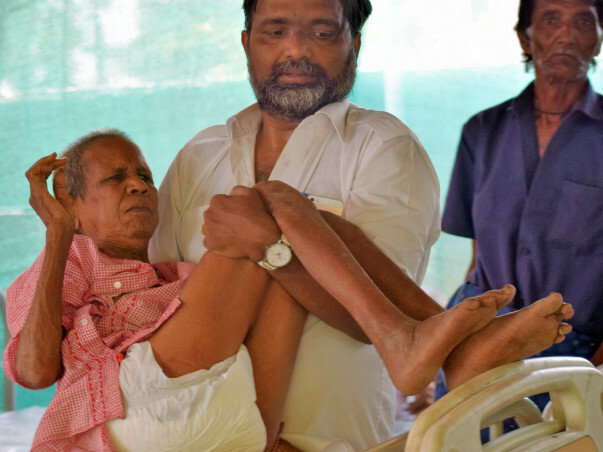 The volunteer caregivers clean and help the elderly from leakage and odor, Often times, unchecked caregiver stress can lead to caregiver burnout—which is far worse. In some cases, a senior may not be able to make it to the bathroom in time which can cause accidents to occur and urinary leakage. Adult diapers are a solution for urinary incontinence problems that seniors have, that reduces the potential for leakage and odor control. This campaign is to help them to be clean dry and hygenic always. how we use the fundraised money ? As we have tie up with whole sale dealers in the city we can get the diaper pack 40% less from Market rate. Most of our donors spend more money to donate diapers, so we feel its better to collect money and buy at once with discounted rate. we would like to raise funds for 6 moths and we can get the same for better price, as the average rescues in a week is around 4 to 5 elderly people this would be sufficient enough for the period of 6 month. 535500/- in retail sale rate. donors who want to donate 10 packs they can help us to buy more quantity at the same price. we can save around =153000/- which is big money. help us to save your money pls contribute to help us buy the material in bulk. We thank all the donors for their constant support to take this forward and help us provide better lives to the elderly homeless and give them a dignity and respectful life in their later stages of life. Please visit https://youtu.be/m5EiaZs4xaM to view our work so far and how we are managing to help them because you helped us. 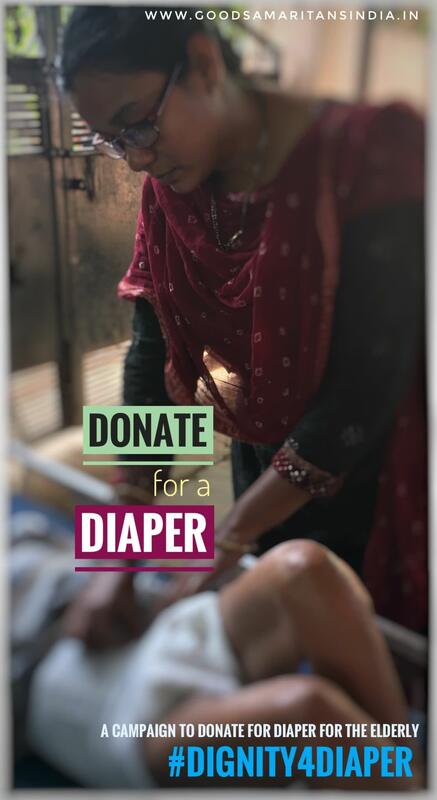 We are able to buy necessary diaper require for the residents of our destitute home regularly and able to keep them clean and dry and prevent them from infections. We thank everyone for their support and encouragement to continue our work and do more rescue in the coming future and help them survive with dignity and respect.